Thanks to Dr. Zafar Ali, Shifa International Hospitals Ltd. (Pakistan) for contributing this case. To contribute a Case of the Week, follow the guidelines on our main Case of the Week page. Our world-renowned faculty include Dirk M. Elston, M.D. (Course Director), Steven D. Billings, M.D., Yadira Hurley, M.D. and Melissa Piliang, M.D. (1) A big thanks to Dr. Gilbert Corrigan for his generous donation to help support our website. Explore ways you can Get Involved if you would like to help us improve our website. (2) In April, we had 2,799,258 page views - a new record! Thanks again for making us the "go-to" site for pathology information. Check out our Monthly Statistics page for more information. (3) Visit our Facebook or Twitter pages (@Pathoutlines) to enter to win a free dissecting kit from Mopec! 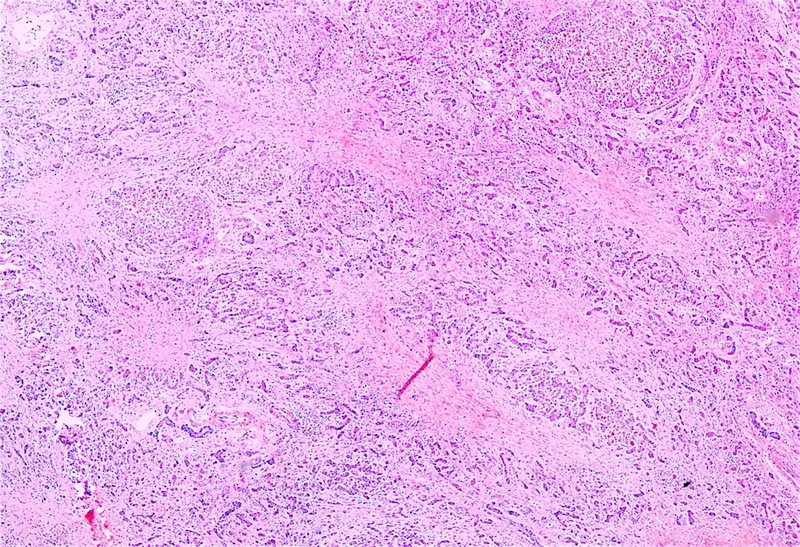 An 8 year old boy presented with acute liver failure and had a liver biopsy. Wilson's disease (WD) is an autosomal recessive disorder caused by a mutation in ATP7B located on chromosome 13. The disease is marked by accumulation of toxic levels of copper in the body, principally the eye, liver and brain (Odze and Goldblum Surgical Pathology of the GI Tract, Liver, Biliary Tract and Pancreas, 2014). The prevalence is 1 in 30,000 live births and the age of clinical onset is variable; the mean age at diagnosis is 17 years (Gut 2007;56:115). 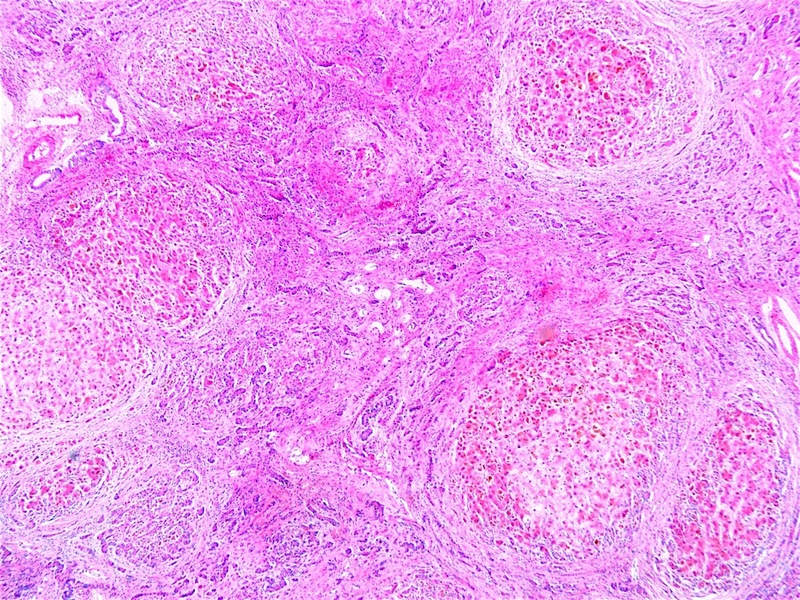 The most common presenting clinical symptoms are neuropsychiatric, followed by signs and symptoms of acute and chronic liver disease including hepato- and splenomegaly, elevated liver enzymes (AST and ALT) and hemolytic anemia (Odze and Goldblum Surgical Pathology of the GI Tract, Liver, Biliary Tract and Pancreas, 2014). 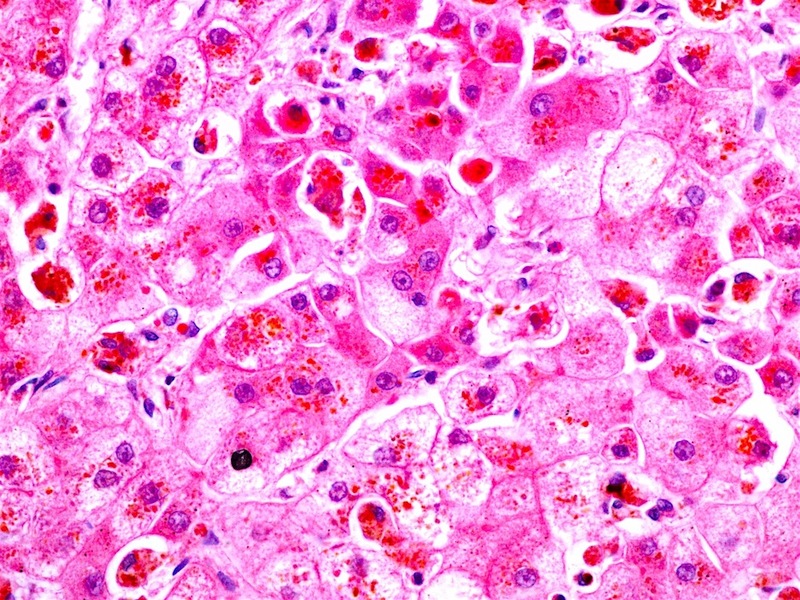 Acute fulminant hepatitis is unusual but can occur. The diagnosis relies on a high clinical suspicion, typical neurological symptoms, presence of Kayser-Fleischer rings (deposition of copper in Deçemet's membrane of the cornea), and reduced serum ceruloplasmin concentration (Crit Rev Clin Lab Sci 2008;45:263). 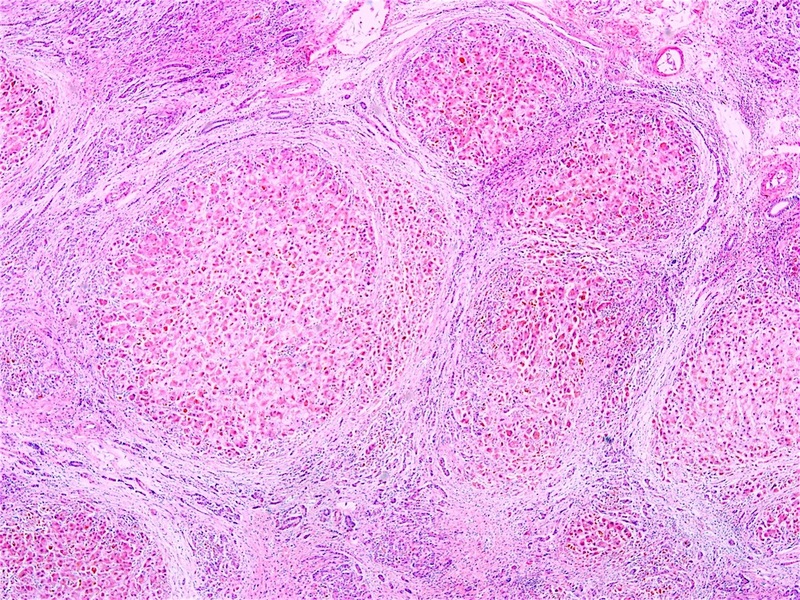 Determination of hepatic copper content by liver biopsy is the single most sensitive and accurate test for Wilson's disease (Odze and Goldblum Surgical Pathology of the GI Tract, Liver, Biliary Tract and Pancreas, 2014). Measurement of 24 hour urine copper is a reliable screening test. Genetic testing using whole genome sequencing for the mutated ATP7B gene is becoming more widely available for cases difficult to diagnose by traditional diagnostic tools (Hepatology 2008;47:2089). Liver biopsy may be performed at any stage of disease, but usually occurs during the more chronic stages. 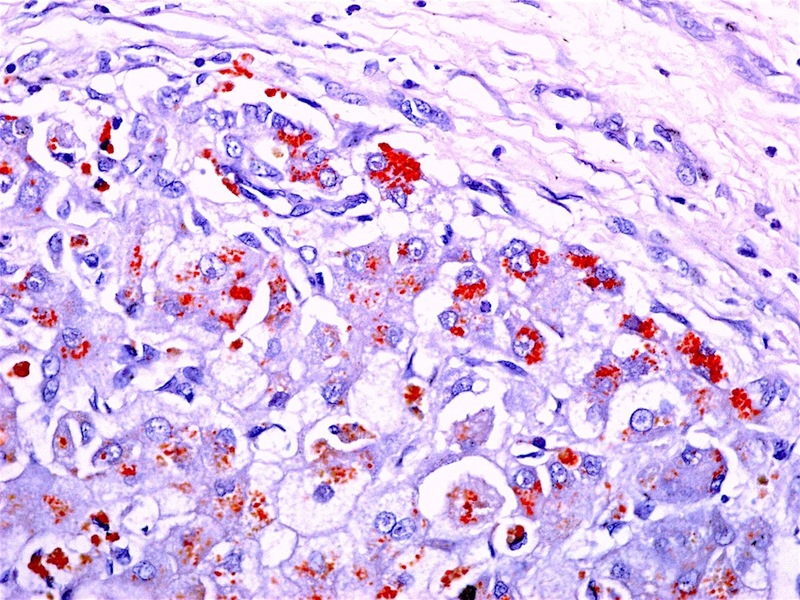 The acute hepatitis features include ballooning of hepatocytes, cholestasis and apoptosis with limited chronic inflammation. 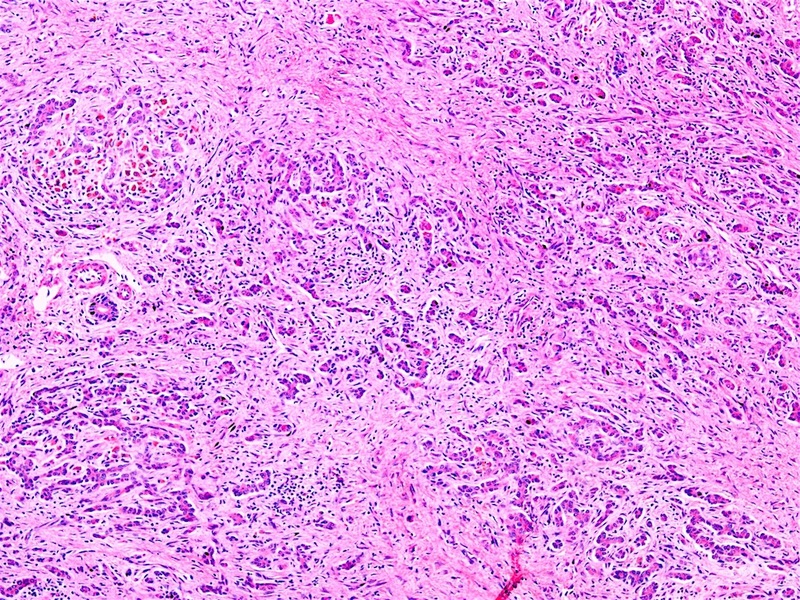 Biopsies of later stage disease show macrovesicular steatosis, vacuolization of hepatic nuclei and foci of hepatocyte necrosis. 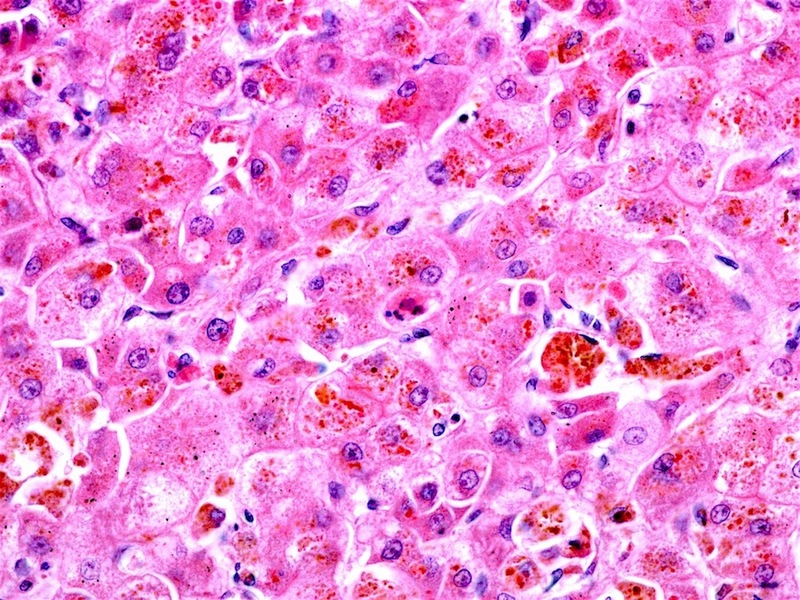 Mallory bodies (brightly eosinophilic cytoplasmic inclusions in the hepatocyte cytoplasm) may be present. There is chronic inflammation of the parenchyma and portal tracts. 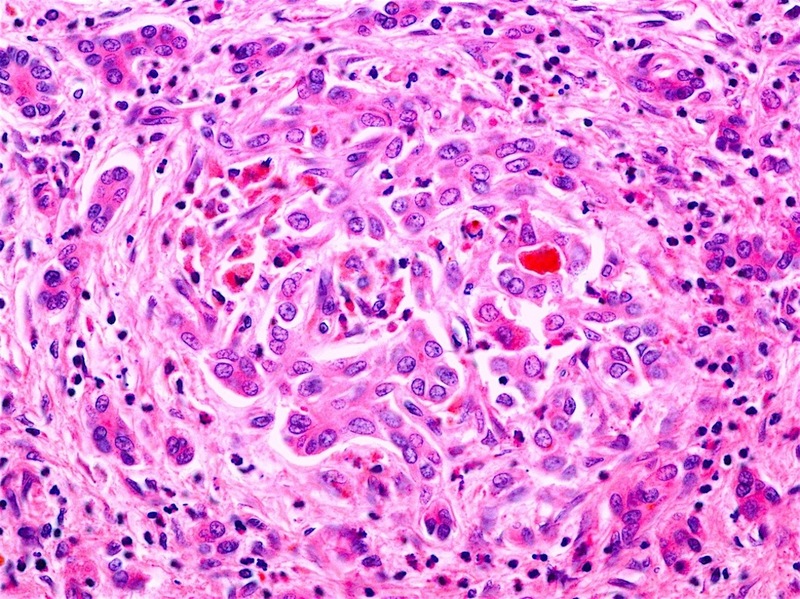 The liver may be cirrhotic, showing nodular fibrosis. 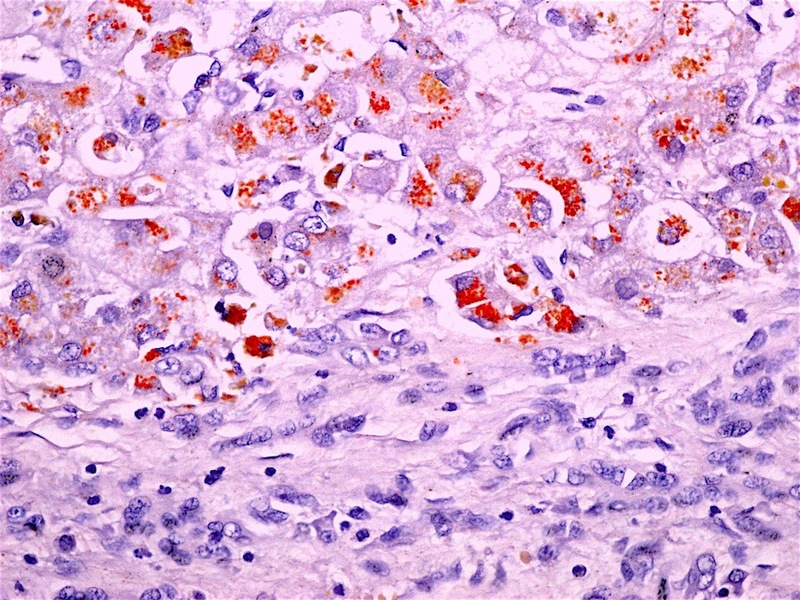 Rhodanine stained sections highlight copper as red-orange flecks (Odze and Goldblum Surgical Pathology of the GI Tract, Liver, Biliary Tract and Pancreas, 2014). 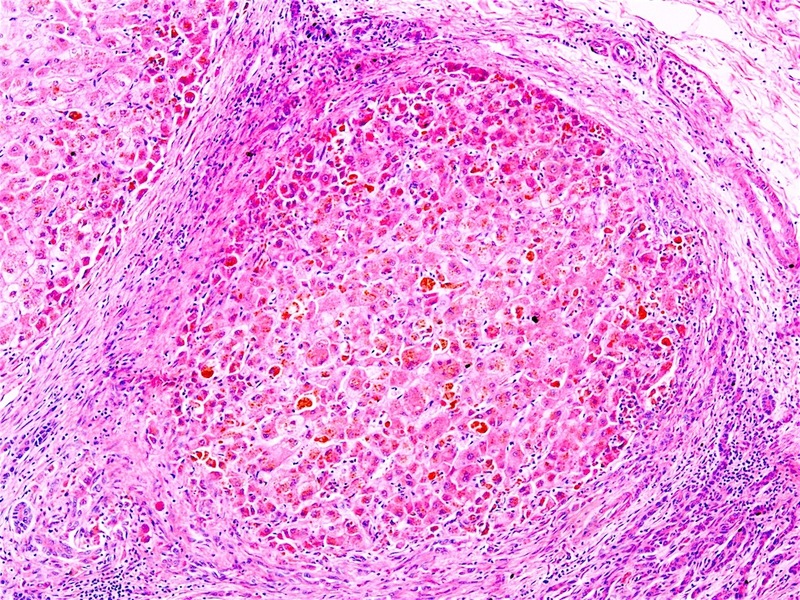 The histologic differential diagnosis includes alcoholic related liver disease and non-alcoholic steatosis. The age of presentation (up to fourth decade for Wilson's disease, increasing age with others) and other clinical characteristics are quite helpful in making this distinction. If untreated, Wilson's disease is fatal. Treatment includes copper chelation therapy with penicillamine to maintain systemic copper balance. Liver transplant may be required in some cases. 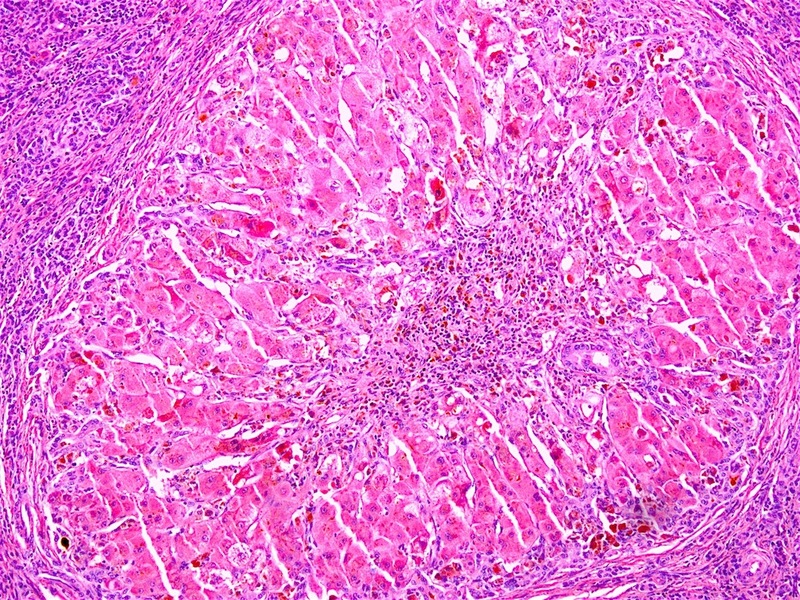 Rarely, hepatocellular carcinoma may develop (Odze and Goldblum Surgical Pathology of the GI Tract, Liver, Biliary Tract and Pancreas, 2014).